Emerging Markets Online is the publisher of Renewable Diesel 2030, Algae 2020, and Biodiesel 2020 market research studies. Each study is focused on the feasibility of starting emerging enterprises, business case studies, public-private partnerships, techno-economic analysis of project development, technology trends, forecasts and scenarios for project development. Renewable Diesel 2030, a new study from Emerging Markets Online, projects global renewable diesel production to increase four-fold from 4.8 million tons (1.4 billion gallons) per year in 2019 to 19.7 million tons (5.8 billion gallons) by 2030. This rapid expansion of renewable diesel production is being driven by low carbon fuels from the pacific coast of the U.S., and an enormous pent-up demand for sustainable aviation fuels in US, EU and Canada. The Renewable Diesel 2030 study covers these fast-growing markets, offers in-depth case studies of renewable diesel producers, and provides detailed profiles of emerging producers and partnerships in the sustainable aviation industry. 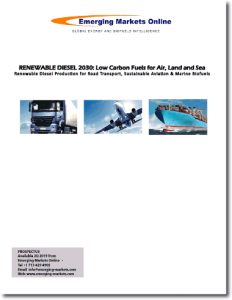 For more info, or to order, visit our Renewable Diesel 2030 studypage here. The Algae 2020 study is a fact-filled guide designed for investors, producers, entrepreneurs, governments, researchers, consultants and executives.Algae 2020 provides a comprehensive roadmap for the commercialization of a portfolio of bio-based products, fuels, chemicals, nutrition, and feed based on site visits with more than 40 organizations. The key conclusion of the Algae 2020 study, published in 2011, is algae producers and enterprises will not survive focused on biofuels alone. This conclusion finds algae developers must be able to produce a portfolio of products for energy, nutrition, and chems markets to supply increasing demands for better, healthier, and more sustainable products looking forward. More info here on the Algae 2020 study and summary of findings. In 2019, diversification and strategic partnerships remain the critical factors for progress in commercial endeavors, government initiatives, and a growing number of public-private partnerships. Emerging Markets Online’s consulting and research services division continues to advise and assist aspiring algae developers, commercial producers, government R&D initiatives, and public-private-partnerships in applying these key strategies to achieve viable, sustainable enterprises for the long-term. Biodiesel 2020, second edition, tracks the U.S. and global markets for biodiesel growth, details major feedstock trends, and provides analysis of biodiesel consumption and production trends. Europe, China, India and Brazil are also covered as case studies. Proprietary forecasts developed for this study are also used to produce 2020 “Scenarios” for the U.S., Europe, China, India and Brazil.